1. Start by creating the batter. Grab a large bowl and mix together 2 eggs, 200g of flour, 450ml of water and a little dashi stock. Set this aside while we prepare for the fun bit. 2. You will need a special Takoyaki grill plate for this! Place your takoyaki plate on the hob and heat up a small amount of oil in each hole. 3. Cut up your octopus into small pieces, but try to get one of those little suckers on each piece for authenticity! 🙂 Place a piece of octopus in each of the semi circle holes and then fill up to the top of the hole with your batter mix. You can even overflow the batter out of the hole to make it easier to flip them later. 4. Now you can add the chopped spring onion, red pickled ginger and tempura flakes to each hole. The amount you add is up to you, but only a small amount of each will give enough flavour. 5. Once the takoyaki are about half cooked, you will need to flip them over. The best way to do this is to use a small wooden skewer to poke the outside of the batter and flip is over within the hole. This takes a bit of practice to get done smoothly so keep trying if you are making a mess! 6. You can usually only flip each takoyaki about three quarters of the way round so allow it to cook a little more before flipping it again. By now, all your takoyaki should be round so keep rotating them in the holes to make sure that they cook evenly on all sides. 7. When your takoyaki are a nice golden colour they are finished cooking. 8. 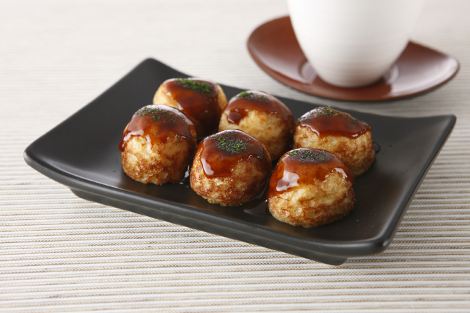 Place a few takoyaki on a plate and smother them with loads of takoyaki sauce and Japanese mayonnaise. Then sprinkle a bit of aonori seaweed and and some katsuobushi flakes on top and enjoy. Be warned, don’t burn your mouth by eating them too soon though as takoyaki are HOT! – Try experimenting with different toppings. The image above shows takoyaki with just the takoyaki sauce and aonori, but adding mayonnaise and katsuobushi is very popular and makes it taste great. You can even use a citrus based soy sauce called ponzu for a sharp taste if you like. – Takoyaki sauce is very similar to both Okonomiyaki sauce and Yakisoba sauce so you can use either of those with no problem if you can’t find takoyaki sauce. Posted in Food and tagged Takoyaki. Bookmark the permalink. I always head to Asakusa Temple for Takoyaki whenever I visit Tokyo, I must admit I didn’t like the sound of it until I tried it, Takoyaki is delicious and it’s one of mthe many things I miss about Tokyo. Thank you for sharing this recipe and I’m going to talk my husband into buying me a Takoyaki pan! Unfortunately, your store doesn’t sell any of the aonori cited in this recipe. We do in fact sell the Aonori sprinkles, the one currently in stock is called Clearspring Green Nori Sprinkles. I’ve updated the link above, which should take you straight there. Should you add egg and dashi stock to the okonmiyaki powder (the instructions on packet are in Japanese), or just water. Thank you for the comments everyone, glad you are enjoying Takoyaki… I have to agree, it is definitely one of my favourites! There is no need to add any extra dashi stock, but you will need to add an egg or two. These are the top three ingredients of the packet so if you follow the amounts of these items you should be fine! I’ve tried this and bought all the ingredients and even the takoyaki pan here in your website! I can just say that delivery was fast and the recipe is really easy to follow!